This morning’s Formula One race was not exactly a fun one to watch. With the largely uneventful racing pockmarked with the dissatisfaction of watching what could have been a decent fight to the finish dissolve into an intrateam communication battle. Words are what won Lewis Hamilton the Russian Grand Prix today, not an exciting on-track battle. If Hamilton had needed to fight hammer and tongs to get ahead of Mercedes teammate Valtteri Bottas, it would have been an awesome race. If the two of them had fought so hard that Sebastian Vettel could catch the pair and make it a three-way battle, all the better. Instead, we were left with a winner that wasn’t excited about his win, and two podium finishers left thinking they had what it took to win, but were hamstrung by team politics. 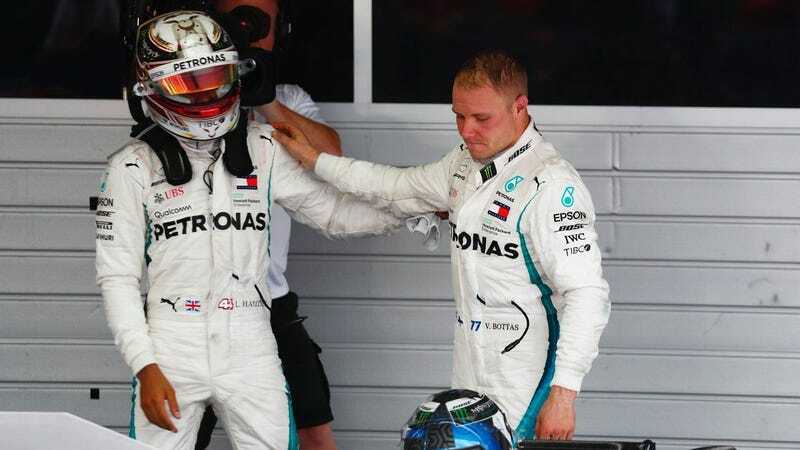 Bottas played the role of the loyal #2 driver, even if he wasn’t happy about it, backing up Vettel during the pit sequence, and later ceding his lead to Hamilton for the sake of seven points. Fans weren’t happy about it either. See the tweets below for reference. Even F1's social media person was nonplussed by the decision. The emoji says it all. In fairness to F1, there was a time when team orders were allegedly outlawed, and that led to the infamous Multi 21 incident. While radio communication was monitored for team orders, teams were perfectly capable of using coded messages, or simply working out race scenarios with their drivers in a briefing ahead of the race to circumvent the rules. This is why it’s impossible to ban team orders, because teams and drivers will always find a way anyhow. So the only logical way forward is to ban teams altogether. Drivers are really only interested in keeping their careers alive, which is why Bottas ceded the position. He wanted to keep his team happy and allow him to stay on for more races, more seasons. If the F1 grid was comprised of 20 individual racers who were only focused on finishing as high as they possibly could, the racing would be much more exciting. Who wouldn’t want to watch that? The current two-driver team structure has existed for a few decades, and it’s created some good battles on occasion. In recent years a few of my favorite team rivalries include Vettel/Webber and Hamilton/Alonso, but there are also some legendary ones, like Senna/Prost. Those great battles happened at teams that allow their drivers to race each other. Ferrari, during the Schumacher years, hired second fiddles to Michael, complacent and compliant drivers who would do what they were told. It would seem Mercedes is doing the same now for Hamilton. It’s a formula that works, but it’s not good for the sport or for fans. However it is done, teams should only be allowed to enter one car per race weekend. Manufacturers could still have two cars on the grid, but they’d have to supply two separate teams with minimal communication between them. Limiting on track testing to one car would slow the pace of development and keep the teams with less money in contention for longer in the season. Adding ten teams to the grid would propagate ten new sponsor opportunities with ten new liveries, and we must admit the grid could use a bit more spicy colors. Running individually means the per-team costs would be lower. In conclusion, team orders are bad. We can’t ban the orders, so ban the teams. Thank you for coming to my TED Talk.